A beginner's banjo needs to play easily and the strings should be easy to push down. You should be able to pick a string lightly near the bridge and hear a clear note. We sell banjos with the traditional sound at an affordable price. We set the banjos up properly, with the proper bridge placement, string height, head tightness and neck relief. 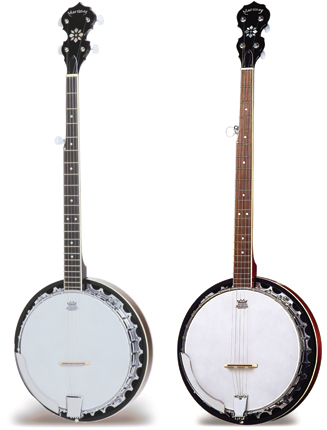 Banjos in the next price level will have better hardware and a better sound than the less expensive instruments. These banjos will have more actual wood in them and the metal parts will be heavier. There will also be cosmetic differences. A banjo hard case is a good investment to protect the banjo. You might want to experiment with picks if you are playing bluegrass. There are options in material, size and shape, so try different finger picks and thumb picks. With the banjo being a fairly heavy instrument, it's a good idea to buy a banjo neck strap. For beginners or advanced players, we have a selection of banjo books.